The classic, Early American style comes alive with our Journey's End Two-Piece Chest. 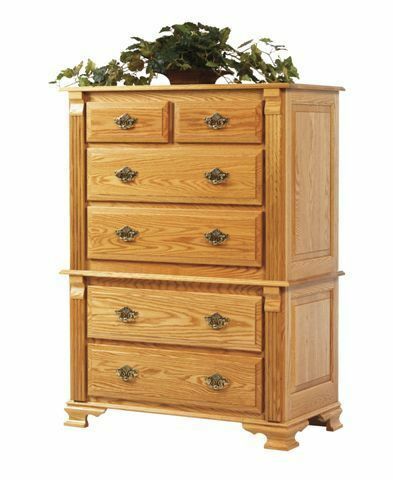 Featuring an elegant Chippendale design, with classic bracket feet and a two half-drawer, four full-drawer layout, this chest will make the perfect statement on your bedroom decor. All drawers from this chest are dovetailed and feature a solid 1/2" drawer bottom that can easily hold 200 lbs. of live weight. They open and close effortlessly using side-mounted ball-bearing slides that allow you to fully extend each drawer box, so you have easy access to all your items. With the optional undermounted slides, your drawers will have the classic floating look of a traditional center-mounted wood slide, but offer you a soft-close mechanism that ensures you never slam a drawer again. Since each piece in Miller Bedroom Collection is bench-built by an Amish woodshop, right in the heartland of Ohio, you can be sure that you're getting heirloom quality, American Made Furniture that is worthy of the appellation. Choose from an array of beautiful hardwoods that are hand-selected for their unique grain pattern and longevity and the Miller's will start assembling your new chest. If you know which stain you prefer, you can select that from the beginning or we can send you a few samples to choose from, so you can be sure you're getting just the right finish to match your unique decor. Call one of our furniture specialists today with you questions or to start your order by phone. We'd love to help you build the bedroom decor of your dreams!